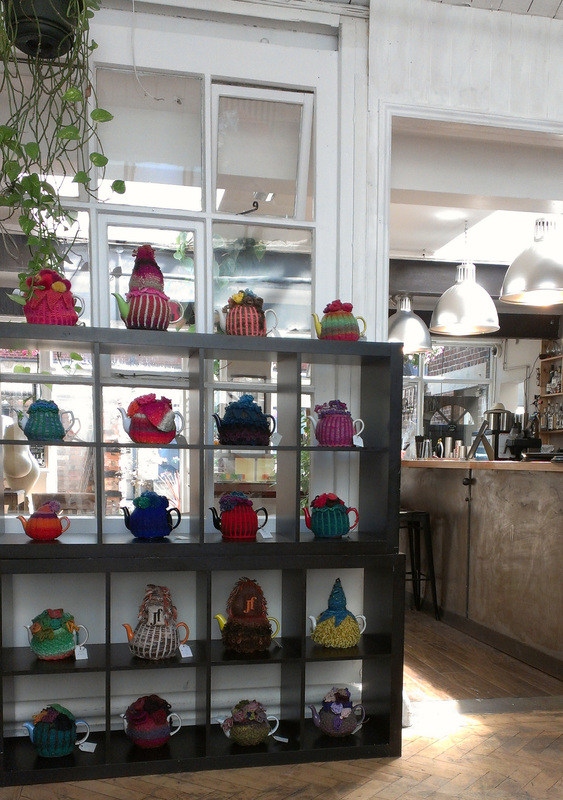 My first review is of the Jam Factory (Hollybush Row, 26 Park End Street, OX1 1HU). Today isn’t the first time I’ve been here; the Baberoo and I have visited several times, most often with my NCT group. The group has been meeting for six months now, trying out Oxford’s cafés and restaurants and naturally gravitating back to the most baby-friendly places. As trepidatious new mothers back in January/February we found the Jam Factory, and it’s still the one we go back to most often. My reviews will be covering eateries I’ve been to before as well as ones that are new to me, but I thought I’d start with a place I love. Today the Baberoo and I arrived a bit too early for the lunch menu, so I tried out the Factory Frittata (£7.50) with a glass of red berry iced tea (£2). Alongside the iced tea came the rest of the pot (freshly brewed and still hot) and the promise of more ice whenever I needed it. 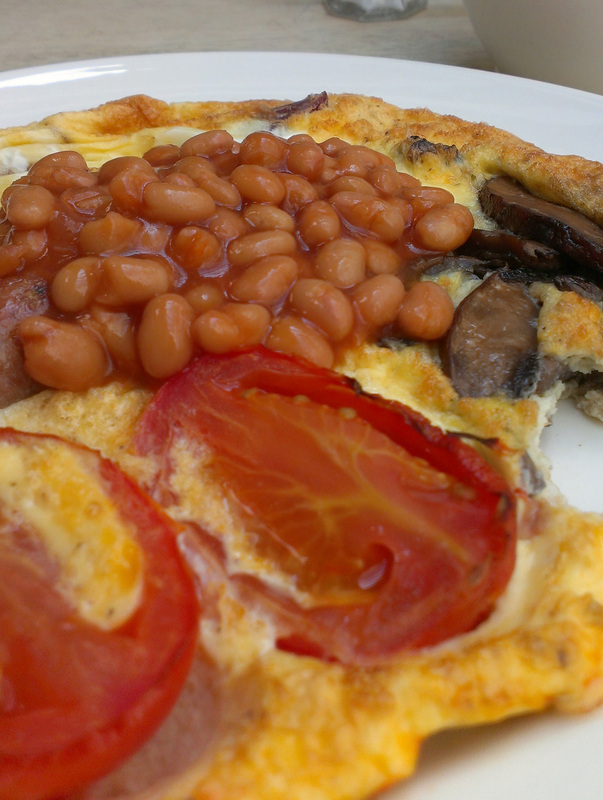 The meal was very much like a full English breakfast (bacon, sausage, beans, mushroom, and tomato) with the eggs in frittata form, binding it all together. I liked that the sausage and bacon were still whole, and I got four (count ’em!) rashers of bacon, which pleased me greatly. So how does the Jam Factory rate for baby-friendliness? Point by point, here’s how it does against my criteria (menu, space, ambiance, facilities, and feeding). For a comprehensive explanation of these criteria, please see my About page. Menu: At any time of the day you’ll find at least one item that can be eaten one-handed, which is something I never kept in mind until I had a baby and realized that one arm would need to be free in case she needed to be held! Eating one-handed is somewhat of an art and I still haven’t perfected it. My frittata today wasn’t a one-hander, but the Baberoo was sleeping in her carriage and then happily playing with a toy while I ate. If she’d been fractious, I’d have ordered a breakfast burrito instead! Space: The Jam Factory has ample space for baby carriages, especially in its café section and its outdoor seating area. I’ve been there with at least six NCT friends and our prams all fit without impeding the other patrons’ means of egress. And it’s not just me and my NCT pals: I saw another group of five mothers with prams in the café today. The Jam Factory is fairly busy with people working on their laptops (with free wifi) but there is usually space to fit carriages in. Ambiance: Lovely, and today a staff member admired the Baberoo, which is always nice. It also showcases interesting art and design (there’s always an exhibit in the café – as well as in the dedicated exhibition space – and there are lovely hand-knit tea cosies for sale), is well-lit, and the music (Aretha Franklin today) is neither too loud nor too soft and won’t irritate your baby with a dancey bassline. The espresso machine does make a very loud sound and in my experience it can wake up sleeping babies, so don’t sit right next to it if you can help it. The only beef I really have with the Jam Factory’s ambiance is that it’s so hot. It wasn’t just this particular summery day (we’re in the middle of a three-week heatwave! This Canadian can’t believe it! ), it’s just generally really hot in the building. The first time I visited – on a cold winter day – I had to take the Baberoo’s outfit off piece by piece until she was practically down to her diaper. I’m not sure what it is about the building – it does have glass ceilings so that doesn’t help – but they sure could use some air conditioning. By the time I walked out of there I was as limp as wilted lettuce. A nice warm room might be helpful in getting small babies to sleep, but this kind of heat is uncomfortable. Facilities: Go for the door with the D; it’s a disabled toilet that also doubles as a baby-changing room. 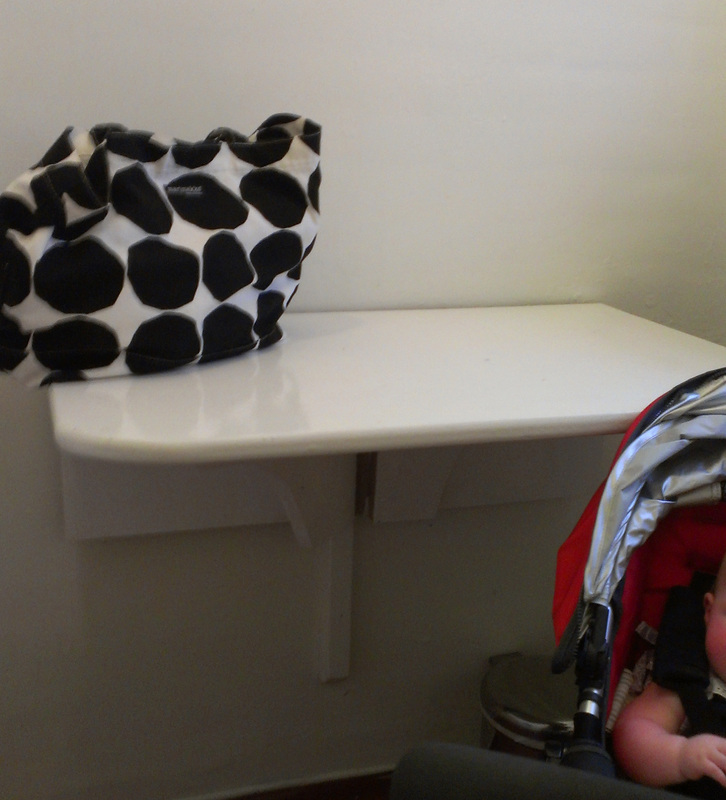 Unlike most baby-changing facilities, the space to lay the baby on is a plain wooden tabletop-type area. It doesn’t have any guard rails so be careful not to let your baby roll. There’s also no disposable sheets to lay your baby on; I have my Thula eco mat (a kind of baby-sized yoga mat) so I just spread it on the table and the Baberoo had a soft and clean surface to lie on. The bathroom is very small; there was just enough room for me to wedge my (admittedly large) baby carriage in and there wasn’t much room left for me to stand. I am not a fan of leaving my empty baby carriage unattended, anywhere, for any reason, because it was damn expensive and I don’t trust anyone (although I doubt that the nice patrons of the Jam Factory would take it!). So I like having a little more room in the bathroom to bring it in with me. That said, the facilities smelled very fresh, they were clean, there was natural light coming through an actual window, and while it wasn’t decorated in any particular way it wasn’t horribly stark like baby-changing areas can be. Feeding: I breastfed the Baberoo while we were sitting at the table and no one (patrons or staff) even blinked an eye. There are plenty of couches and bench seating that can make breastfeeding much more comfortable (the Baberoo is a reluctant public feeder, not because she cares that she’s in public – nor do I – but because she’s so used to the comfy pillow we use at home, so I appreciate it when there are seating choices other than chairs). I know from NCT group experience that bottle-feeding mums are also given prompt attention when they ask for heated water to warm their bottles. 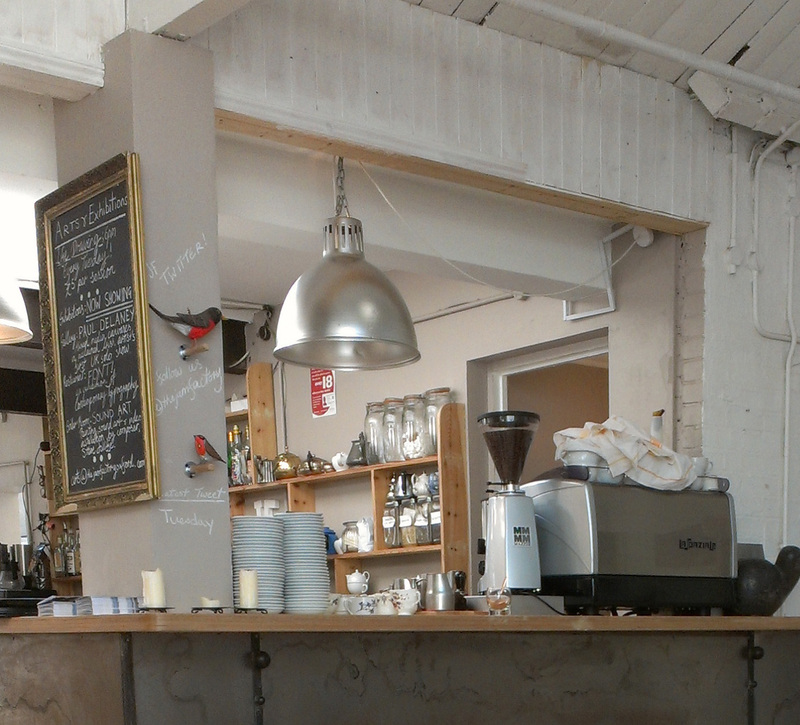 Final rating: the Jam Factory is a lovely place and very baby-friendly. In my book it gets an 8.5 out of 10. It sounds like a nice place.